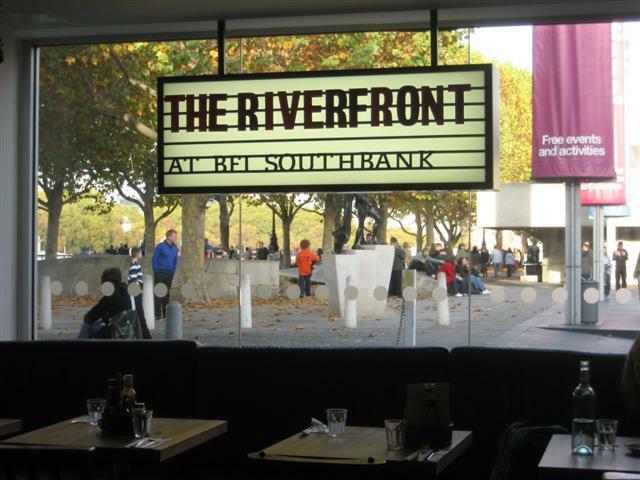 So, as promised we went back to the newly refurbished BFI Cafe. The interior is all new and they have the separated seating areas: one for the restaurant and the other for the cafe/bar. I think that the bar area has tried to become all trendy and I don’t think it works. It has lost its charm, cosiness and its relaxed atmosphere. It is has become more of a bar than a cafe and I think that they are enough bars around. The lighting is dimmer, and its a real shame that they have taken away the high window seats that you could sit on and have views of the river. Also, the big wooden tables and benches that made up the outside seating have gone. 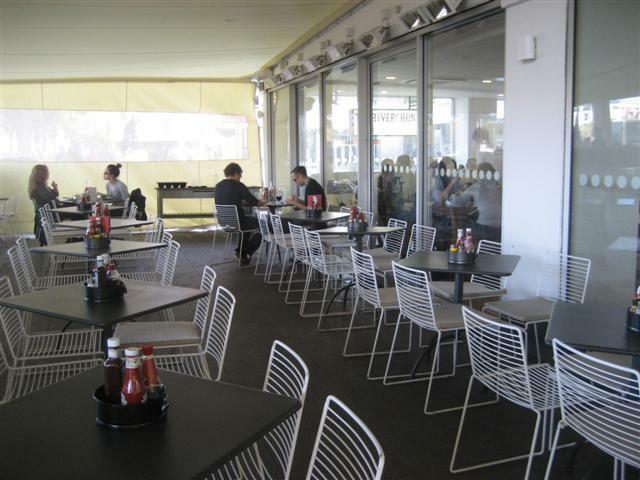 This has been replaced with a hedge enclosed table and chairs area. We used to love the hot chocolates from BFI but not any more. The hot chocolate tasted wooden and like cardboard. Not an indulgent drink at all. It was actually not very drinkable. We miss the rich, creamy hot chocolate that would not fail us, especially on a cold winter’s day. They now serve soy milk. Now onto the restaurant area. This has actually improved and feels a lot cleaner and defined. 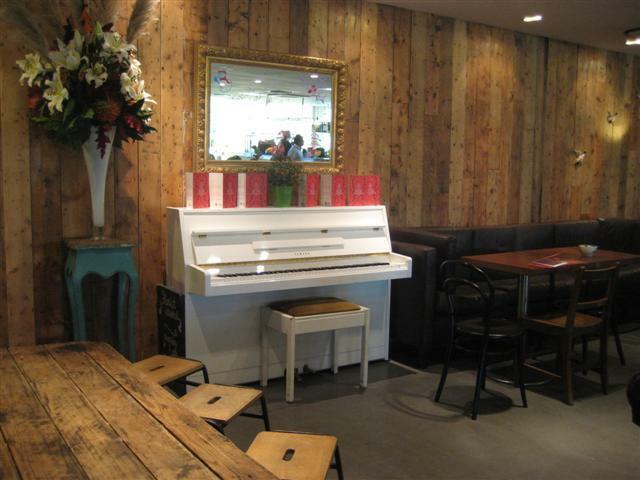 There are huge wooden communal tables as well as individual seating. You can still see the open kitchen area. We had the veggie burger which came with salad. The staff were happy to replace the salad with chips. The bowl of chips were good. They were more like chip shop chips which made a nice change. The veggie burger was really tasty and it was in a nice soft white bun. The veggie burger had a really nice tangy taste and was very moreish. I would actually say that it is one of the best veggie burgers out there. One major thing that we had a problem with was the hygiene standards that we could see going on in the kitchen area. This particular situation happened after we had eaten our food. There was a tray of fried onion rings on the shelf between the kitchen area and the restaurant area. One of the chefs was just eating these onion rings and then in the next moment, he was cooking the food in the kitchen. He did not have any gloves on nor did he wash his hands before making the food. I think that this is quite unacceptable. More should be done to ensure good hygiene practice. Another thing to mention is that we could see our food just waiting on the shelf, before it was served to us. It was there for a real long time and we were surprised that it was still hot when it was served. The service was quite slow. There seemed to be a lot of staff who did not seem to be very attentive. All in all, we had a mixed experience. This cafe has lost all its charm. The original star rating, as can be seen from our original review was a fantastic 5 stars. We feel that this is no longer justified. BFI used to be one of our most trusted and favourite places. Now, we are not sure that we would really return to this establishment.